Flickr Photo Appears to be Taken With a Motorola DROID HD? A set of photos has popped up over at Flickr that appears to have been taken with an unannounced device called the Motorola DROID HD. At first we blew it off as being nothing or possibly someone messing with EXIF tags, but as we dug through some additional photos from this user, we noticed that they also had images posted that were taken with a DROID3. 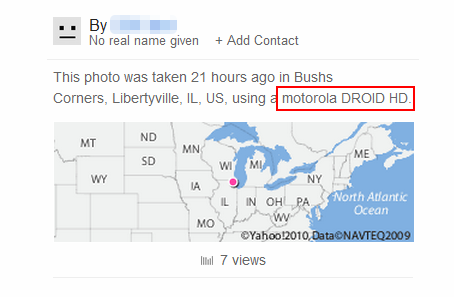 And to make things ever more interesting, all of the photos were geo-tagged from inside Motorola’s offices in Libertyville, IL, just off of Motorola Parkway. So what the heck is the DROID HD? We have absolutely no idea. Could it be the new Bionic or something to come just after? Are we talking massive HD screen or just a marketing tag?